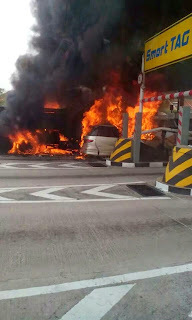 A lorry and two cars burst into flames at the Kesas Sunway toll booth. According to a tweet from the accident happened at the westbound Sunway toll booth. A Kesas spokesman said there were no casualties reported, and the accident was caused by the lorry. The driver must have lost control of the lorry and rammed into the toll booth and both cars. The lorry driver fled the scene. The drivers from both cars managed to escape the fire. The accident caused a massive jam which is being cleared up.